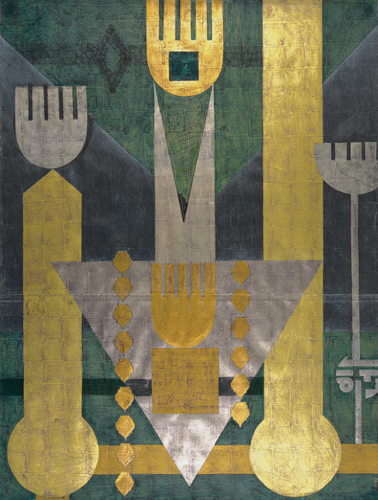 Faramarz Pilaram was—along with Charles Hossein Zenderoudi and Parviz Tanavoli—among the first modern Iranian artists to employ both calligraphic forms and Shiite iconography. These three mixed-media works (G1975.110, G1975.111, and G1983.12) in the Mosques of Isfahan series refer to the famed houses of worship in Pilaram’s native city of Isfahan, which were built during the reign of Shah Abbas (r. 1587–1629) when it was the capital of the Safavid Empire. In his work, architectural fragments and body parts merge to create hybrid beings. While the stylized hands may allude to the architecture ofsaqqakhaneh, or public fountains—as they do in Zenderoudi’s The Hand—they also refer to mosque architecture. Domes and minarets appear as geometric forms alongside similarly abstracted representations of religious props, such as the hand of Hazrat Abbas, which typically appears in processions during the holy month of Muharram. Dimensions 45 3/4 x 34 3/4 in.